Solid wood Scandinavian style chair with wide seat and clean lines. Wood has been painted in a cream semi-gloss. 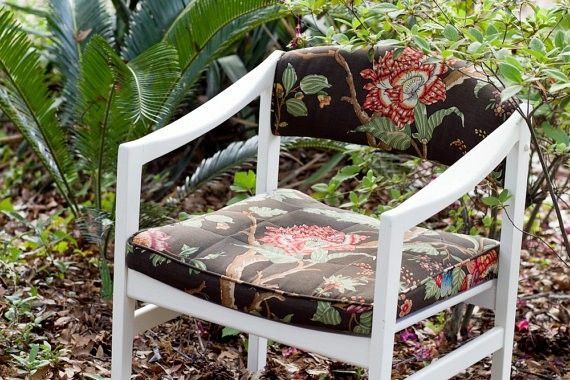 The chair seat and back rest have been upholstered in a brown floral canvas boasting an array of colors, which include red, orange, yellow, green, blue, and tan, making it a good fit in almost any colorway. Seat has been quilted in a square pattern. Dimensions: Chair measures 30" tall at back and 17" tall at seat. Seat is 25" wide.